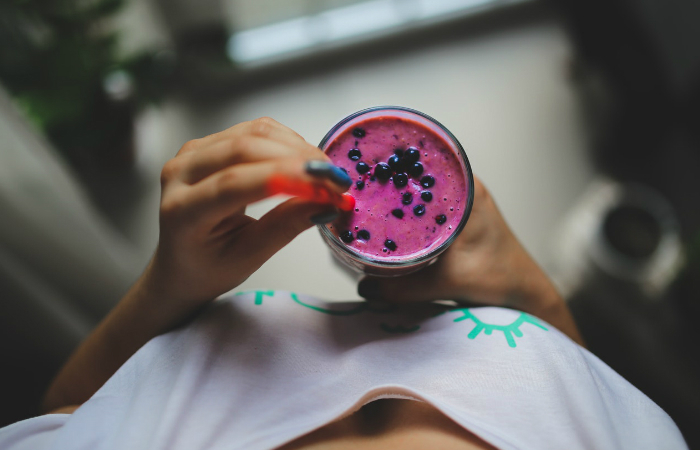 Smoothies come in different consistencies so you need to know the tricks. The techniques you should learn can easily provide you a thicker or more watery smoothie anytime you want. Stay with us as we discuss various ways on how to make a smoothie! To guarantee smoother consistency, you really need a blender. But, you should think further about which type to use if you love experimenting different flavors. A standard blender is great for big servings. However, a personal blender is better for experimentation. Personal blenders are much smaller, usually serving one tall glass only for every process. They lead to less waste if you are still trying out different flavors. The only crucial thing you need to remember about food processors is to only use less liquid than the usual amount. If you put more liquid than necessary, the food processor will leak. To be more specific, if the liquid covers the whole blade piece, it will ultimately leak out of the machine’s middle section. The most common ingredient in smoothies is fruit. Fresh fruits are not the only options here; you may also use frozen, dried and canned fruits. 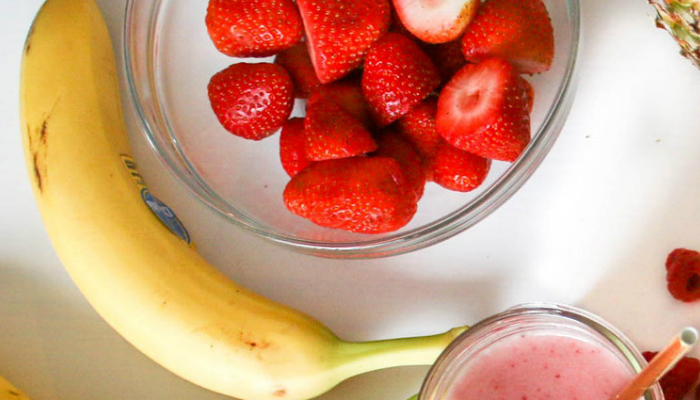 You can definitely use more than one fruit to complete a single smoothie. So, it can be fun to experiment various combinations and surprise yourself with the results. A tall glass of fruity smoothie usually needs at least a half cup of fruits. This is great for fruits with thicker consistency such as bananas. You may also add up to two cups of fruits if you will use smaller types such as berries. Confused about which fruit to try first? The choices we are going to give you are great for both pure and combination smoothies. Indulge yourself in pomegranates, avocados, mangoes, kiwis, apples, bananas, raspberries, blueberries, strawberries, and peaches. If you want a more watery smoothie, then you really need juicier fruits. Common options are pineapple, watermelon, and orange. Some people just want the taste of these fruits, not their consistency, so they just add a certain thickener such as protein powder. It can be tricky to experiment since some fruits are not meant to be combined together. For starters, we are giving you two foolproof combinations: peach-raspberry and strawberry-banana. According to the peach-raspberry smoothie recipe from Two Peas & Their Pod, the whole process is so simple that it will only take five minutes to complete. 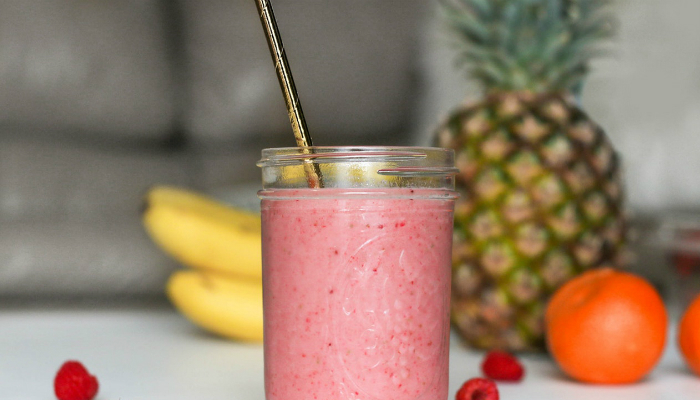 This smoothie is a nutritious addition to one perfect breakfast, snack or dessert. 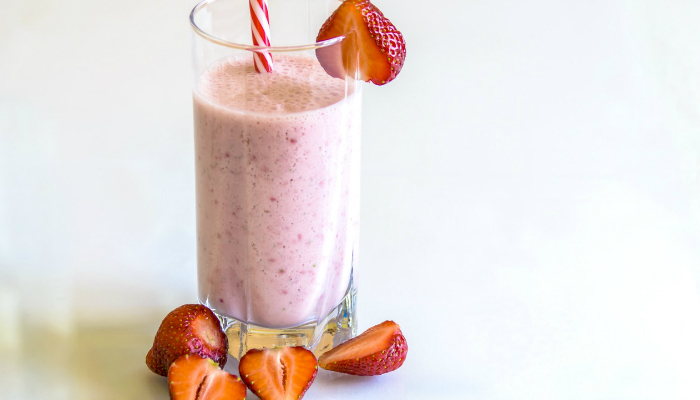 Meanwhile, a strawberry-banana smoothie is a classic combination. The recipe from Gimme Some Oven guarantees a fresh, sweet smoothie that is packed with nutritional benefits. Who says water and milk are the only liquids for making smoothies? Surprisingly, there are several options to choose from. Some of which are even creative selections. The standard formula for a single serving is to add 375 milliliters of liquid to the smoothie’s fruit component. Make it less if you will use a food processor or make a thicker smoothie. Pure water will always be the healthier version, but some people are actually using sparkling, carbonated or soda water for their smoothies. 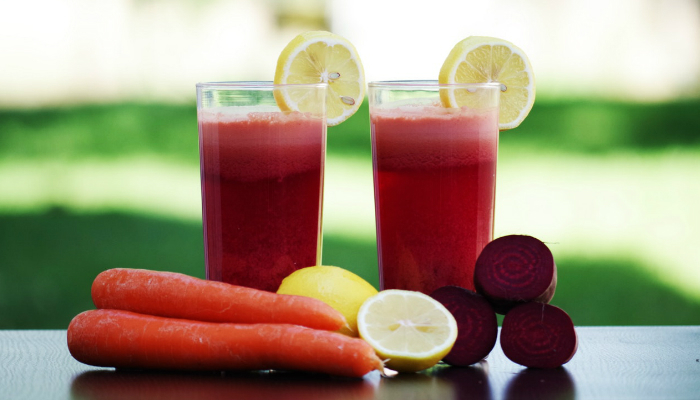 Unexpectedly, with lemon or lime-flavored sparkling water, the smoothie gets a lighter taste. While whole and skim milk are the popular choices, soy milk is also a good alternative. It is best for people suffering from lactose intolerance. It also gives additional protein for the muscles. For a more complex taste, add coconut milk to your smoothie. As an alternative, use almond milk. The nutty flavor gives a more tropical take on smoothies with exotic fruits. If you do not like icy smoothies because of the texture, resort to a partially melted ice cream for a cold yet smooth mixture. Alternatives to ice cream are frozen yogurt and sherbet. To guarantee a thicker smoothie, use plain or sweetened Greek yogurt. Make sure to drink Greek yogurt smoothie only when you are hungry for the mixture will be too heavy for your stomach. You might get sick and throw up, especially when you are inside a moving vehicle. Are juicy fruits not enough for you? Then you might like the fact that fruit juice can actually be used as a liquid for smoothies. The red flag, however, is the tremendous amount of sugar compounds in just one drink. It is best to balance fruit with another type of liquid if you have a certain health condition. Chai, herbal or black tea is a great addition to smoothies if you are not much of a sweet tooth. It can reduce the sweetness until it fits your palate. The best part? Tea makes a fruity smoothie healthier than ever, mainly because of its antioxidants. Some people consider smoothies as their meal. To make a smoothie more fit to be called a meal, protein powder is a great choice. Popular selections are soy and whey. A lesser known alternative is sprouted brown rice. Other sources of protein you may add to smoothies are tofu and cottage cheese. You do not have to put a lot of greens into your smoothie. Just put a tiny amount of spinach, kale, celery or parsley. You can add any kind of herb or vegetable actually. As long as you have a blender or food processor in your home, you can already experiment with different flavors of smoothies. Learning how to make a smoothie is super-easy since you only need to use an effective fruit combination and a liquid that matches your consistency standards.